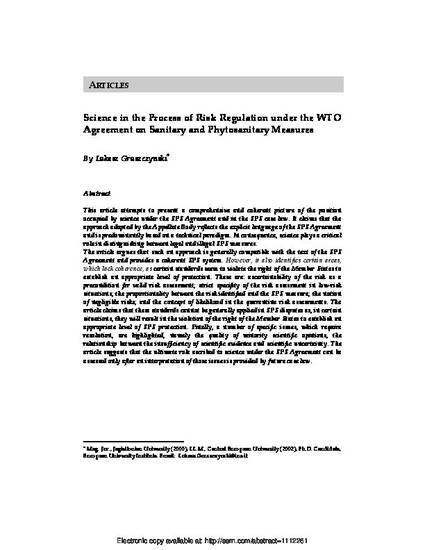 This article attempts to present a comprehensive and coherent picture of the position occupied by science under the SPS Agreement and in the SPS case law. It claims that the approach adopted by the Appellate Body reflects the explicit language of the SPS Agreement and is predominantly based on a technical paradigm. In consequence, science plays a critical role in distinguishing between legal and illegal SPS measures. The article argues that such an approach is generally compatible with the text of the SPS Agreement and provides a coherent SPS system. However, it also identifies certain areas, which lack coherence, as certain standards seem to violate the right of the Member States to establish an appropriate level of protection. These are: ascertainability of the risk as a precondition for valid risk assessment; strict specifity of the risk assessment in low-risk situations; the proportionality between the risk identified and the SPS measure; the notion of negligible risks; and the concept of likelihood in the quarantine risk assessments. The article claims that these standards cannot be generally applied in SPS disputes as, in certain situations, they will result in the violation of the right of the Member States to establish an appropriate level of SPS protection. Finally, a number of specific issues, which require resolution, are highlighted, namely the quality of minority scientific opinions, the relationship between the insufficiency of scientific evidence and scientific uncertainty. The article suggests that the ultimate role ascribed to science under the SPS Agreement can be assessed only after an interpretation of those issues is provided by future case law.